A bonus extra post for today’s Freight Car Friday feature. 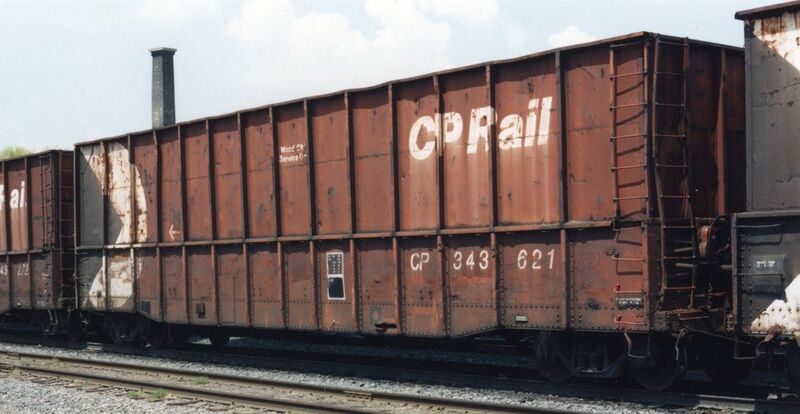 These cars bearing HS reporting marks are also common mixed in with the CP wood pulp service boxcars. These cars are leased to CP for wood pulp service by GE Railcar Services. These cars are a wild variety of seemingly random small sub-groups of cars from various builders (the above car is an FMC, while the bottom car is built by Berwick and coupled on both ends to other HS cars built by ACF) making any sort of even basic guesses as to their heritage impossible. Most of these cars are older (early 1970s built) “plate B” cars rebuilt to raise the roof and extend the inside height from 10’6″ to 11’0″. All feature the distinctive carbody vents marking their assignment to wood pulp service. The Berwick car below also has reinforcing panels added to the car ends, as does a CP car coupled to the left of the HS 61554 above. The top photo of a freshly shopped HS 61554 was taken in July 2015 at Hawk Junction, while the below photo of HS 61213 is at Sault Ste. Marie in August 2004. Additional leased cars bearing short line reporting marks SLGG, OAR, BR and YVRR (the former two being more common in 2004 and not so much seen now, and the latter two coming on the scene more around 2012 or so) are also commonly mixed in to the wood pulp fleet. A pair of modern examples of Canadian Pacific boxcars in wood pulp service at Sault Ste. Marie on July 12, 2015, arriving back in Canada from Michigan to head back to CP via the interchange at Franz. The top car was built new for CP in 1998 by Greenbrier’s Trenton Works in Trenton, NS. The bottom car’s history is a little more obscure. An early 1970s design from Pullman-Standard, the car’s original owner before coming to CP is unknown. It would have been repainted and renumbered into its current identity in 2001 (and probably rebuilt to raise the roof and add an additional 6 inches to the interior height of the car at the same time). The flat plates on the sides of both cars are protective covers for vents in the carbody. These vents are typical on modern cars in wood pulp service to allow moisture in the product to escape. Not to be confused with raw products like pulpwood logs or woodchips, wood pulp is a semi-processed intermediate step in the paper production. While some paper mills, like the Abitibi (later St. Marys) paper mill in Sault Ste. Marie are integrated mills covering the entire paper-making process from logs to pulp to finished paper, some mills are only pulp mills, producing market pulp which is sold to other mills for turning into other finished paper products. Boxcars in the transfer track at Franz will likely be in wood pulp service. Late 1990s, WRMRC collection. While there weren’t any pulp mills on the Algoma Central, this was a very common form of bridge traffic from pulp mills on along the north shore of Lake Superior served by Canadian Pacific at Marathon, Terrace Bay and/or Red Rock to finishing mills in Michigan and Wisconsin. Some pulp may have also been delivered to the mill in Sault Ste. Marie, but I believe most of this traffic actually crossed the border into Michigan. This switchlist at Franz also shows that at least some of this traffic went north to mills east of Hearst on the Canadian National (now Ontario Northland) as well. 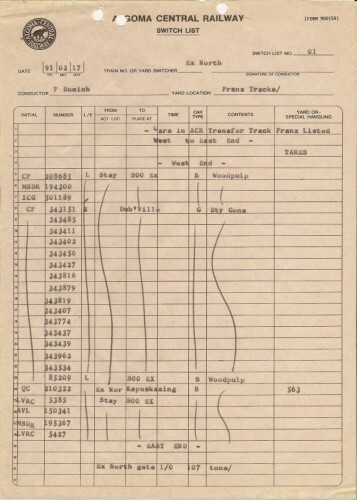 The switchlist shows one car of woodpulp being forwarded to the Spruce Falls Power & Paper mill at Kapuskasing, which produced newsprint. Wood pulp continues to be an important source of bridge traffic on the former ACR. My recent visits have resulted in spotting quite a number of pulp service boxcars owned or leased by CP on the ACR: at Sault Ste. Marie arriving in the daily freight train from Michigan, at Hawk Junction in the regular CN freight, and in the siding and transfer tracks at Franz (as seen from my ride on the Tour of the Line in 2013). Modern example of a CP wood pulp service boxcar at Hawk Junction, July 2013. Plates at top and bottom of car are covers for vents, common on modern cars assigned to pulp service. My photo. Wood chip traffic on the ACR primarily derived from the sawmills and Dubreuilville and Mead. Both mills were large sources of chip traffic – although not at the same time. In 1974 Newaygo Forest Products built a new modern mill 20 miles south of Hearst on the ACR at Mead to produce lumber and wood chips for export to the United States. The woodchips would be shipped to a paper mill in Appleton, Wisconsin. 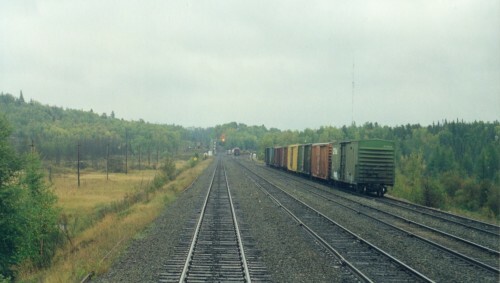 To supply cars for this traffic the Algoma Central purchased 89 cars from National Steel Car in 1974, with unique ACIS reporting marks designating them under some customs rules or regulations for International Service. A further 23 cars with regular AC reporting marks were added in 1980. These large capacity cars, the biggest cars on the ACR roster and painted a unique pale green colour with yellow end doors and “billboard” lettering cut a striking appearance, and travelling over almost the entire length of the railway and into Michigan and Wisconsin, there are several good photos of both of these car series available. They seemed to ship up to about half a dozen cars at a time from Mead, and extra empty cars would often be stored in the siding at Horsey or Coppel, on either side of Mead. ACIS 1433, one of a few survivors from the Algoma Central’s woodchip car fleet at Steelton yard in 2001. Blair Smith photo. The mill at Mead shut down in 1985 bringing this traffic to an end. In about 1986 or 1987, Dubreuil Forest Products installed a new chip spur and loader at their mill at Dubreuilville to load woodchips for the pulp mill on the Canadian Pacific at Marathon. 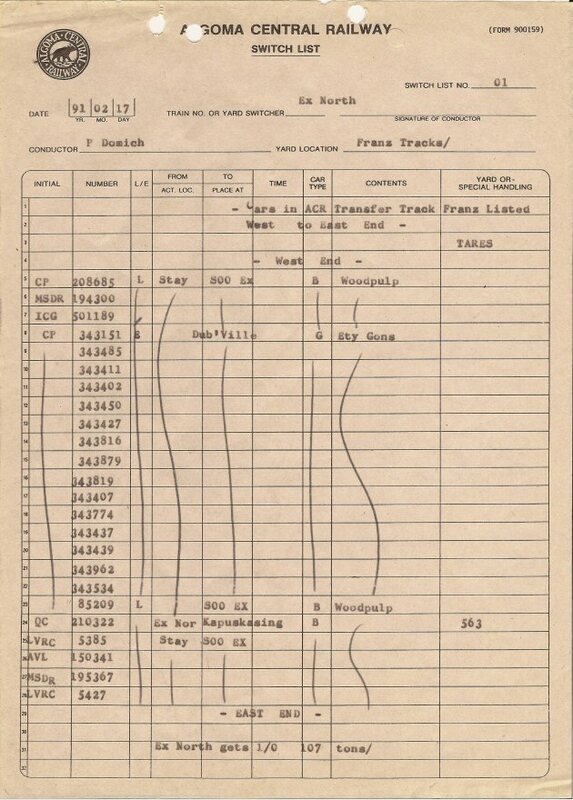 Cars for this service were 52′-60′ gondolas provided from Canadian Pacific. Over 100 cars were provided, with empties stored in the sidings at Goudreau and Wanda north and south of Dubreuilville to protect the loadings at the mill. 1991 switchlist showing cars in the transfer track at Franz. 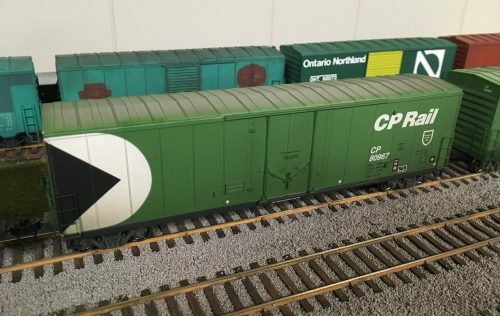 The dozen empty CP 343xxx series gondolas listed are woodchip cars for Dubreuilville. Despite the large numbers of car loads involved, since they operated only between the interchange at Franz and the mill at Dubreuilville about 10 miles south, and both locations being a bit more than just slightly off the beaten path, this traffic wasn’t too visible and I haven’t seen much in the way of photographs of these cars in ACR trains, unlike the much more visible AC/ACIS woodchip gondolas that were used to service the Newaygo mill. Fortunately the cars have been well photographed in other locations, particularly as many survivors have recently been used in tie service. A common variation of CP’s woodchip gondolas rebuilt from a 52′ gondola with extended sides. Bill Grandin photo. During the 1990s, the AC (and later WC) ran an weekday evening “Franz Turn” out of Hawk Junction to switch lumber and chip loads at Dubreuilville and the interchange at Franz. The mill at Dubreuilville closed in 2007. After Newaygo shut down their operations at Mead, the fleet of AC and ACIS woodchip cars were sold off, with many cars being transferred to Newaygo for use on other operations. One place where ex-Algoma Central cars with Newaygo (NFPX) markings seemed to show up regularly in the 1990s and early 2000s was at the Lecours Lumber stud mill west of Hearst, on trackage now operated by Ontario Northland. These chips apparently headed down into the US somewhere, so by a curious twist of fate, these ex-Algoma Central cars continued to operate over the former Algoma Central rails for several years. NFPX 1511 with a load of woodchips at Steelton yard, 1999. Blair Smith photo. I’m not sure when this service ended (or if indeed it still continues on a periodic basis) but in my few visits to the area over the last few years I’ve never seen any chip cars.